The Crescent Hotel, located at the highest point in the county, overlooking the Eureka Springs and the Ozark Mountains, is the symbol of Arkansas hospitality. Rich in history and ghost stories, the hotel still retains its 19th century character. It still has antique furnishings, gardens, unsurpassed mountain views and Victorian style rooms. And is widely renowned as one of if not the most haunted hotel in the country. 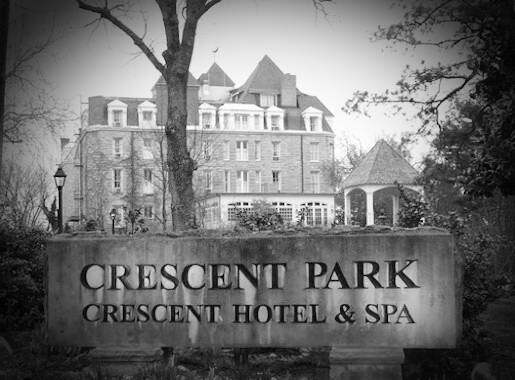 The Crescent Hotel in Eureka Springs is one place which is frequented by several ghosts. Staff members have been receiving a lot of reports from guests of strange occurrences in their room. Room 202 is the room where a ghost was photographed in. In room 218, guests have reported strange sounds, sensations, and even full bodied apparitions. Doors have slammed shut by themselves and people have been awakened at night. It is reported that Room 218 was the location of a strange death. One of the builders (Michael, an Irish stonemason) of the hotel fell from the roof during construction in 1885. He landed and died on the spot where room 218 was built. The lobby and the halls are not exempt from these ghosts. People have reported seeing a middle aged man with a moustache sitting in the lobby and sometimes in the bar area. He only sits quietly and then suddenly vanishes. Back in 1987, a guest claimed they saw a nurse pushing a gurney down the hallway in the middle of the night. After reaching the wall, the nurse suddenly vanished. Other guests have reported seeing Norman Baker, the one-time owner who cruelly fooled so many cancer patients in to thinking he had a cure. The Crescent Hotel was designed in 1886 by Isaac L. Taylor, an architect. It ran as a hotel for several years until it no longer had the finances to do so. In 1908, the hotel was opened again as a school and was then called the Crescent College and Conservatory for Young Women. Again, it could not afford to stay open for financial reasons and closed again in 1924. It reopened in 1930 until 1934 as a junior college. After the school closed, it was leased as a summer hotel. In 1937, Norman Baker bought the property and made it into a place for people suffering from cancer. Because of fraud allegations and federal charges, Norman Baker was imprisoned for four years and The Crescent Hotel was left without an owner. With the Crescent Hotel, you can be certain that your stay will be pleasant and memorable at the same time. Aside from providing travellers and guests with a place to sleep, the hotel has various other amenities to cater to all your needs. The Crescent Conservatory is a room surrounded by arched windows and overlooks 15 acres of landscaped gardens and the Ozark Mountains. The Crescent Conservatory has 1313 square feet of space and is one of the best places to have dinner. The Crystal Dining Room conjures images of elegance. It has beautiful chandeliers, hardwood floors, and high ceilings. This is the perfect place is best for corporate lunches and dinners. The East Lawn is the perfect place for an outdoor reception. The lawn has a historic gazebo and a garden. If you want the perfect garden wedding, this one would make a great choice. The Faculty Lounge and Sunset Terrace can easily seat up to 50 guests so it makes the perfect place for small and intimate celebrations. It has 345 square feet and is located on the 4th floor. It features an outdoor deck with scenic view of the picturesque surroundings. The hotel’s Ghost tour is a must-try for people who enjoy the paranormal. Reservation is necessary to ensure that you will be able to join the tour. Reservations can be made online and tickets can also be purchased online. Eureka Springs is a place where the whole family can enjoy. It is popular for its family-oriented attractions. A cruise on Beaver Lake will certainly be a good break from all the hustle and bustle of city life. A ride from the vintage Eureka Springs and North Arkansas Railway will bring you back in time. The Great Passion Play, a play which depicts Christ’s last days on earth is a must-see. The cast includes hundreds of exotic animals which makes it a great treat for the whole family. The Crystal Bridges Museum of American Art is open every day except on Tuesday. You will see the history of America through art and the beauty of the surrounding landscape. Dr. Baker’s Bistro is located 1,430 feet above sea level in the Ozark Mountains. The restaurant offers a full later-night menu and it is open from Mondays to Saturdays from 9 in the evening until midnight and on Sundays from 9 until 10 in the evening.